Estimates, Quotes, Invoices and Shopping Lists on the go. 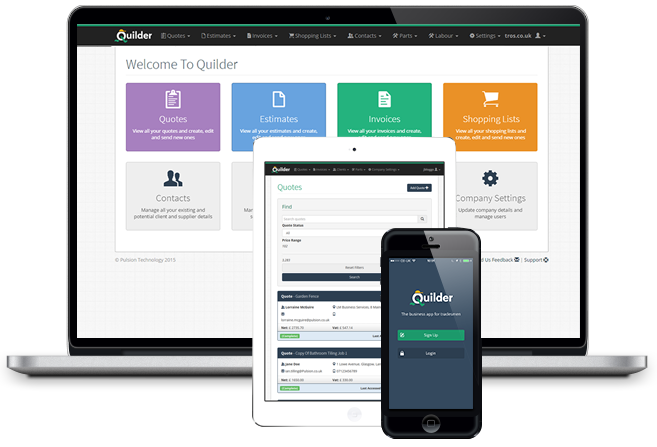 Try Quilder, the free estimate software designed for tradesmen. Whether you are a joiner, plumber, roofer, electrician or any other professional in the construction industry, Quilder can help you save time and win more business. Also, use shopping lists with your preferred supplier for convenient pricing. New Shopping List feature makes parts pricing for tradesman easier! Create quotes, estimates, invoices and shopping lists quickly and easily. Search and get prices for 100,000+ parts from major UK building suppliers. Use convenient shopping lists to obtain prices. Modify your estimate templates, view all your estimates and invoices, and manage your customer information. Easily create shopping list(s) for all the necessary parts. You can now send a PDF version of your quote, estimate or invoice straight to your customer. You can now include sections and headings to your quotes, estimates and invoices. You can now create an accumulated shopping list for easy pricing with your chosen supplier(s). You can now change the colour of your quotes, estimates and invoices to match your company logo. Start sending estimates and invoices straight from your mobile device. It only takes a couple of minutes to register and it is completely free!